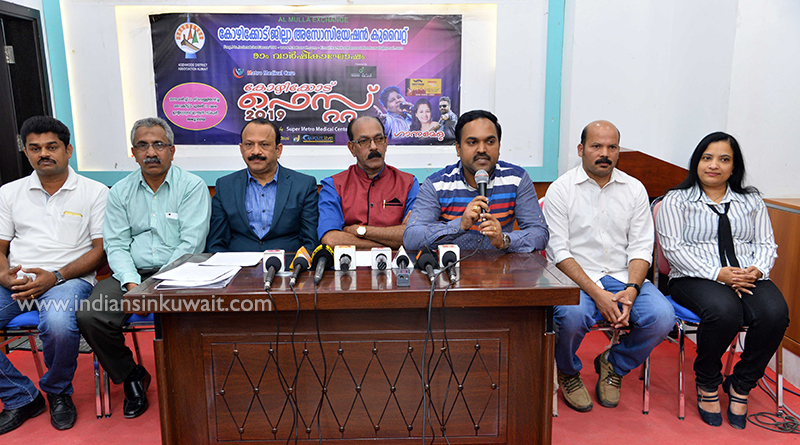 IndiansinKuwait.com - Kozhikode District Association conducts its 9th Anniversary "KozhikodeFest-2019"
Kozhikode District Association conducts its 9th Anniversary "KozhikodeFest-2019"
Kozhikode District Association conducts its 9th Anniversary celebration titled “Metro Medical Care KozhikodeFest-2019” on 22nd March, Friday at Integrated Indian School, Abbasiya from 5.00 PM onwards. The grand celebrations will be inaugurated by Ms. Mariam Al-Qabandi, the renowned Kuwaiti blogger, Writer, Kuwait TV weather reporter and academically is a teacher too. The Kozhikode Fest 2019 is conducted as a source of income for Associations Charity scheme ‘Karunyam’, through which we offer financial aids to the neediest and financially backward people who suffer from serious illness. The ‘Karunyam’ scheme was started from the associations formation stage itself and we were able to forward our helping hands towards many of patients under treatment for major diseases like Cancer, Kidney patients, Heart patients etc... Meanwhile association is offering financial aids to our members who meet up with accidents or death itself through the Family benefit scheme. Unfortunately, last year 2 of our association members faced unexpected death and we were able to distribute the financial help without any delay to their bereaved family members. Through these years’ association was able to distribute nearly 70 Lakh rupees (12 Lack in current working year) through these schemes. There are plenty of such financial aid request applications continuously reaching to us. To meet up these funds and to forward help hands towards the poor one’s events like Kozhikode Fest help us a lot. Association is always keen to celebrate all traditional festivals of all religions in grand style. Each year the celebrations starts with Iftar Meet, Onam-Eid celebrations, Christmas –New year & ends up with Vishu celebration. All of these celebrations are unique and memorable due to the large participation of members and the variety entertainment programs delivered by Balavedhi and Mahilavedhi members. Mahilavedhi members organizes Free Medical campaigns, Medical seminars, Malayalam classes.etc. every year. This year Association cancelled few celebrations after the unfortunate Flood in Kerala and handed over good funds to Chief Ministers Relief Fund and distributed aids to flood affectants in Kozhikode district. Kozhikode Fest 2019 is colored by the magical voice of most popular Vaishnav Girish, the winner of Indian Idle accompanied by Playback singer Sindhu Premkumr and Youth icon singer Nihas Bhavana. Also the fest explores the talented artist in Kuwait through their musical and dance shows. The activities of association are always supported by Kuwait’s socio-cultural society. The role of Kuwait’s media in exploring our activities and delivering it to the common man is highly appreciated. We use this opportunity to Thank you and request your cooperation’s for the grand success of Kozhikode Fest-2019 too. 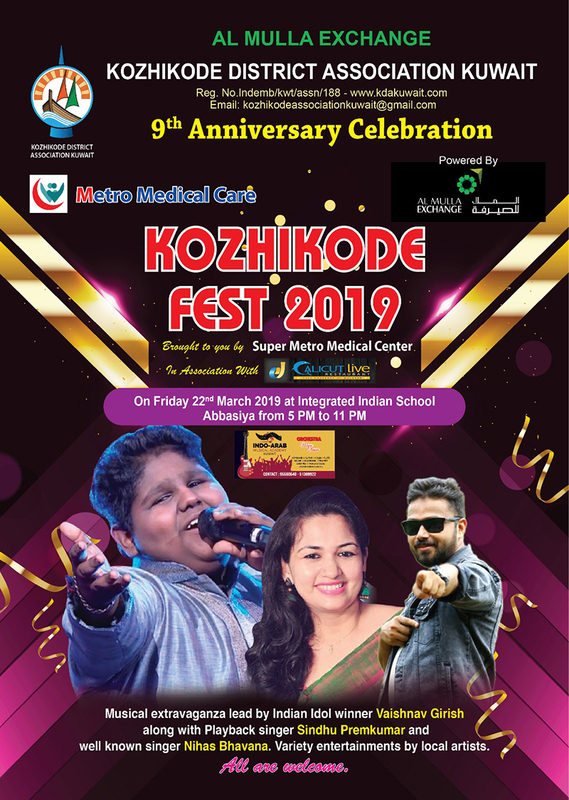 We once again invite all of you to Metro Medical Care-Kozhikode Fest-2019.